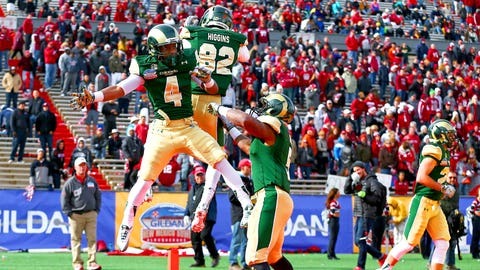 The Colorado State Rams won the 2013 New Mexico Bowl in dramatic fashion vs. the Washington State Cougars. It was the tale of two games in the New Mexico Bowl. The Rams trailed by as much as 22 points at the 2:48 mark of the second quarter, but they had scraped back into contention and were down only 45-37 late in the fourth quarter thanks to two touchdowns by RB Kapri Bibbs, a pair of field goals by kicker Jared Roberts, and a TD throw by QB Garrett Grayson. Still, the Cougars took over possession with 2:52 remaining, and on the fourth play of the drive, Washington State even survived a scare when QB Connor Halliday was ruled down before the football slipped from his grip. Unbelievably, the Cougars coughed up the ball on the very next play when the Rams’ Shaquil Barrett ripped the football free from RB Jeremiah Laufasa. Colorado took the ball over at the WSU 33-yard line and began marching down the field with under two minutes to play. As is customary, the Rams then kicked off. With four seconds left, Rams kicker Jared Roberts entered the game and nailed a 41-yard field goal to send the frenzied fans onto the field. Cougar quarterback Connor Halliday is no stranger to throwing the ball: He ranks first in pass attempts in the FBS with more than 600 throws this season.The junior tied a career high for TD passes when he racked up five scoring throws and 221 yards vs. the Rams — in the first half. Better yet, he spread around the wealth, finding a different receiver for each one of his touchdowns. Running back Kapri Bibbs was held out of the end zone until he punched in a one-yard rush at the tail end of the half. Bibbs carried the momentum from that score into the third frame, when he broke free for a 75 yard TD run. The rush was his longest of the game, but more impressively, it represented his 30th touchdown of the 2013 campaign. He became only the third college player in FBS history to rush for 30 TDs in a season — RBs Barry Sanders and Monte Ball are the others on that list. Plus, he snapped the Colorado State record for most rushing yards in a single campaign, finishing with 1,744.